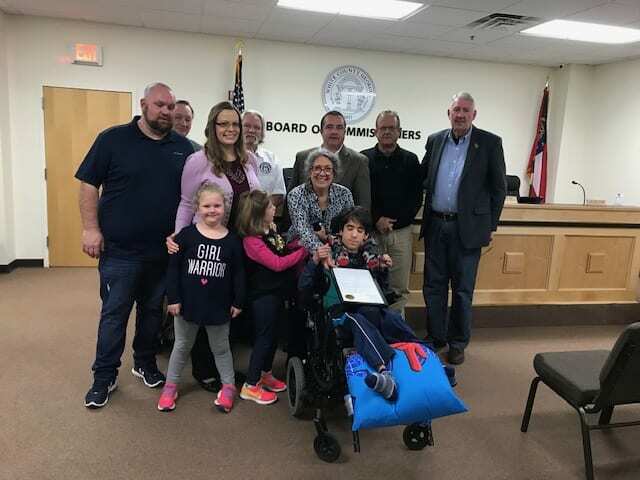 CLEVELAND, Ga. – In a moving declaration, White County Commission Chairman Travis Turner read a resolution proclaiming March 4-8, 2019 as Exceptional Children’s Week in White County during Monday’s work session. In reading the resolution, Turner pointed out some interesting facts, including: 10.3 percent of White County residents under the age of 65 have a disability; 566 students in White County students are currently receiving special education services and 75 percent of special education students graduate from White County High School every year. That graduation rate is double the state average and ranks in the top five in Georgia. During Exceptional Children’s Week, the White County School System and community partners will host activities celebrating the acceptance of students with disabilities. A disability A to Z book will be published, workshops and lectures will be held at Truett McConnell University which will educate parents, school staff, college students and the community at large about a variety of disability topics. In other business, staff presented a draft short-term rental ordinance for the Board to consider that sparked a 45-minute discussion during the work session and set the state for the called meeting that followed. In the end, nothing was settled and Turner said, “We’re trying to get our arms around this. I don’t know where we’re going yet but, gentlemen, I do believe we’re going to have an additional meeting. In January, the Board imposed a 90-day moratorium on short term rentals that ends April 8. Commissioners did pass a resolution to express opposition to House Bill 302 which would prohibit local governments from adopting or enforcing ordinances or regulations relating to or regulating building design elements as applied to one or two family dwellings. Photo: Front: Shawn Ellis, Brook Ellis (girl) Ashley Ellis (mom), Bailey Ellis, Joe Grillo (chair), Jane Grillo. Back: Commissioners Terry Goodger, Craig Bryant, Travis Turner, Lynn Holcomb and Ed Nix.